If you want to travel to the human capital city in style, festive hot air balloons have been commissioned to ferry important dignitaries and noble adventurers from every corner of Tyria. Unfortunately, there are forces at work that will stop at nothing to sabotage the celebration. Speak with the Balloonist at each tower to find out how you can help them keep things on schedule! Once you arrive at Divinity’s Reach, speak with a local Herald to find out where the party is, and enter the brand new Crown Pavilion to observe the opening ceremony. The vista outside the Pavilion has been modified to give a bird’s eye view of the new structure. Be sure to check it out! After the opening ceremony, entering the Crown Pavilion will bring you to the public version of the map, where the real festivities begin! Speak with any of the emissaries in the center of the pavilion to receive a special buff to Magic Find, one of your stats, and a resistance to one of the enemy types found in the Pavilion. Defeating any enemy in the Crown Pavilion while representing an emissary will progress an achievement track for representing that emissary’s city. Participate in any of the dynamic events that occur regularly in the crown pavilion, or simply fight the enemies within to gather more Watchwork Sprockets which can be traded to the emissaries for special rewards. For those seeking more of a challenge, take your Queen’s Gauntlet tickets to the upper balcony to participate in one-on-one battles against powerful champions. See if you can beat all twelve! For an even greater challenge speak with the Master of Gambits outside any of the Queen’s Gauntlet arenas to voluntarily handicap yourself in the next fight. The challenge will certainly be greater, but so will the rewards. If you need a break from all the fighting, seek out one of the Torchbearers in Divinity’s Reach. Light all of their beacons before your torch goes out and brighten up the city! Light all of the Beacons of Kryta to earn the Flames of Kryta, a permanent torch you can use to light your way in the darkest corners of Tyria. 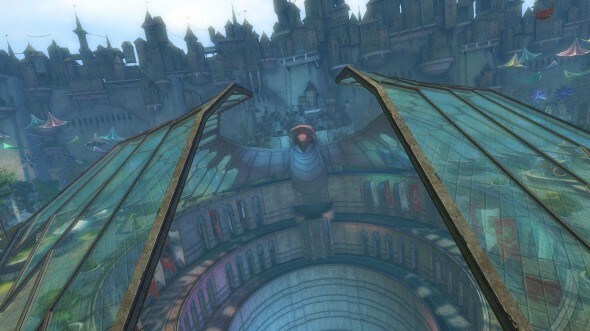 Visit most of the Balloon towers throughout Tyria to earn the Hot Air Balloon Souvenir, your very own mini hot air balloon you can carry with you wherever you go. Defeating enemies in the Crown Pavilion or winning fights in the Queen’s Gauntlet will award Watchwork Sprockets and Watchwork Boxes, which contain Sprockets, Queen’s Gauntlet tickets, salvage material, or a chance at a new rune or sigil recipe. Purchase the new Sovereign weapon skins from the emissaries in the pavilion. For a flat rate of gold and Watchwork Sprockets, you can own one (or more) of these stoic and regal weapons. Very rarely, you may find a Watchwork Portal Device inside one of the Watchwork Boxes. These devices are single-use items that allow you create two-way passages for you and your friends. The meta achievements for the Jubilee (that’s right, there are two of them!) will work in a slightly different manner than they have in the past. Each day, a new daily achievement associated with the Jubilee will be available. Completing this daily grants progress toward the meta. So whether you’re the type of player who wants to complete all the content, or the type of player that just hops on for a little while every day, you should have no problem earning your very own Mini Watchknight to commemorate the occasion. The Queen’s Gauntlet achievements are a little more challenging, so they have been separated into their own achievement category, with their own meta-achievement. Battle-hardened adventurers who manage to best the Gauntlet will receive a miniature version of the toughest combatant in the Gauntlet. 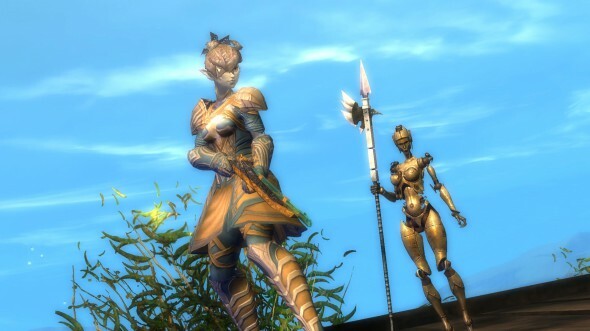 This entry was posted in Guild Wars 2, Other Games on 11/01/2013 by admin.